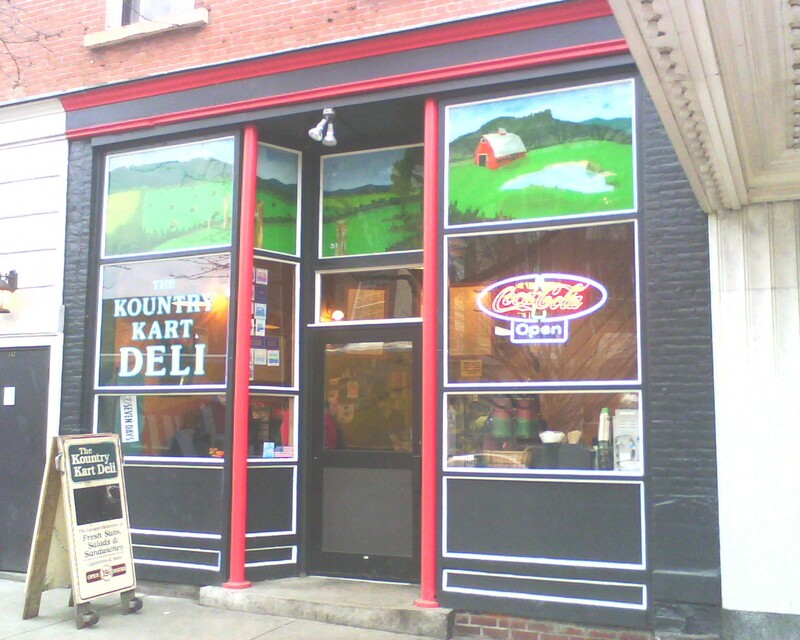 Kountry Kart Deli on Main Street in Burlington Vermont is a late night munchie classic. 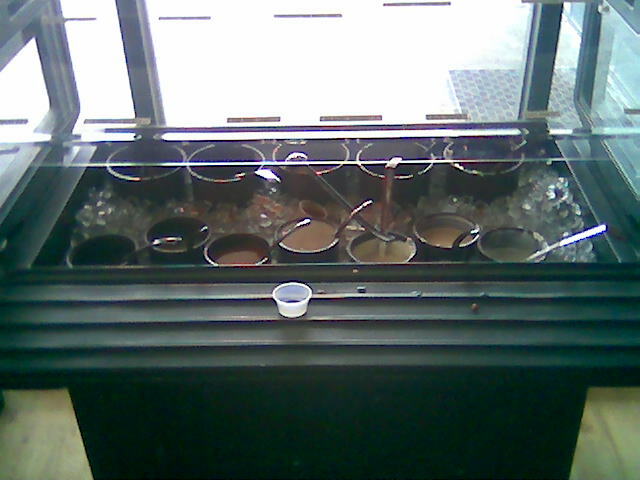 Drunken from the bars will fill KKD to capacity shortly after the 2am last call; sandwich chaos ensues. But they’re also open for lunch. I’ve been lunching on KKD’s Philly on French bread, so when I noticed the “Shiner Philly” I decided to try it (sans French bread as the circumference of the hash brown would likely cause severe over-hang). 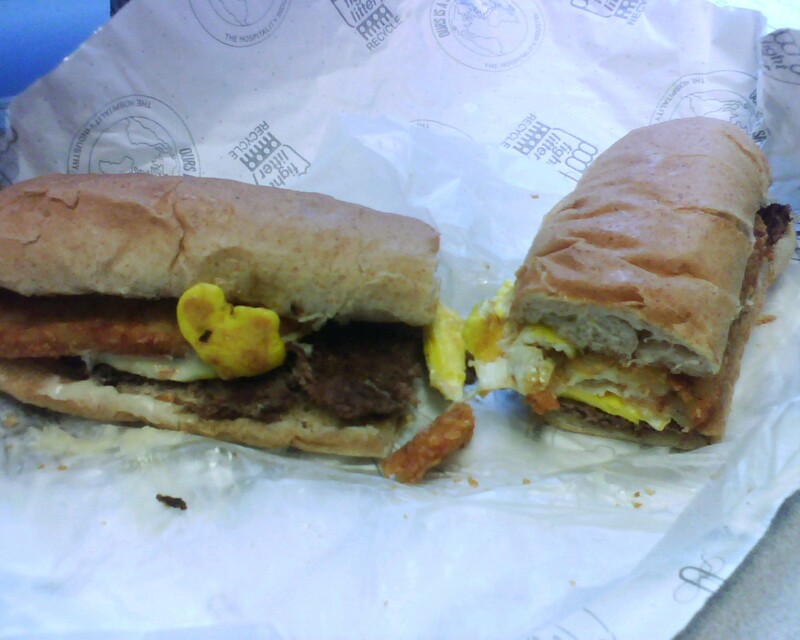 KKD is known for their “Risers” and “Shiners”; a shiner being a deep-fried hash-brown / egg / meat breakfast themed sandwich. I couldn’t resist trying collaboration of the Shiner Philly. The hash-brown is nicely fried, and has a satisfying crunch. The egg is real, the steak and cheese is good. 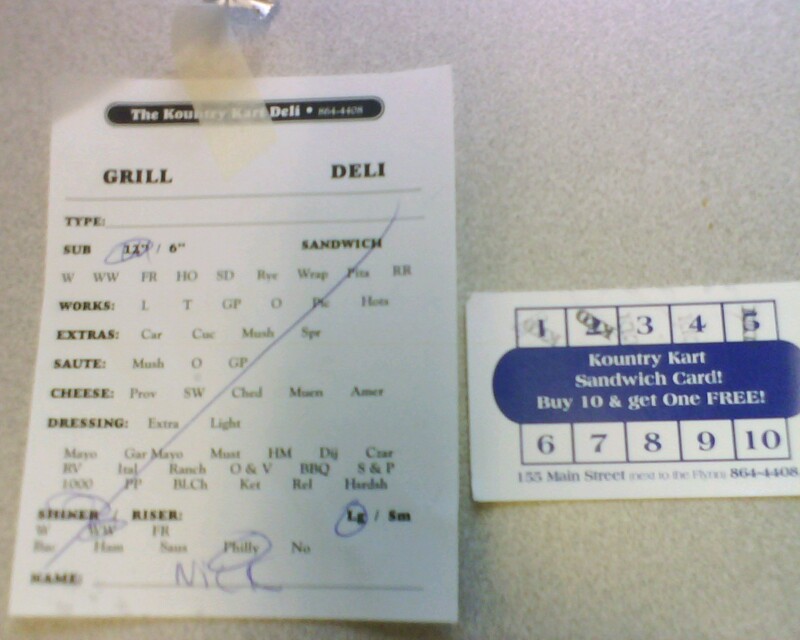 I which there were more steak, I may ask for “extra Philly” when ordering this sandwich in the future. I should have ordered it with the trifecta of grilled onions, peppers, mushrooms. Also I didn’t enjoy eating two large hash-browns. I would recommend ordering this sandwich as a small, as to not kill exceed your hash-brown budget. At City Market a new fall arrival, cider donuts from Champlain Orchards of Shoreham Vermont. 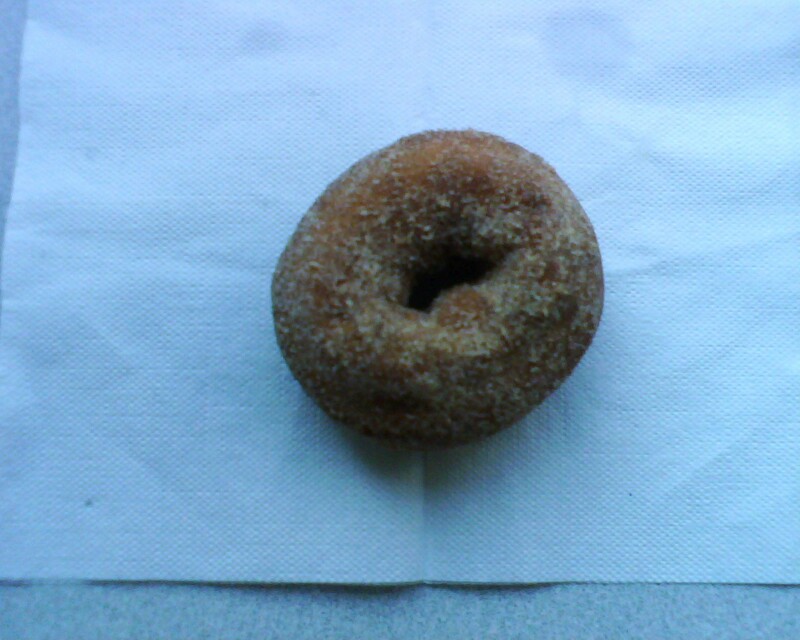 I love Cider Donuts. River’s Edge Coffee Shop and Grill (RIP) had the best crispy, unctuous fried cider donuts, I’m looking for a new cider donut provider. Champlain Orchards offerings are good, the cinnamon / sugar coating works well, however I prefer my cider donuts straight-up. These also are not crispy, but were very moist and have some cider flavor. $.89 per seems pricey since these donuts are smaller than “standard” donut size. I’m not aware of another cider donut vendor in town, so to get your fix head to City Market. 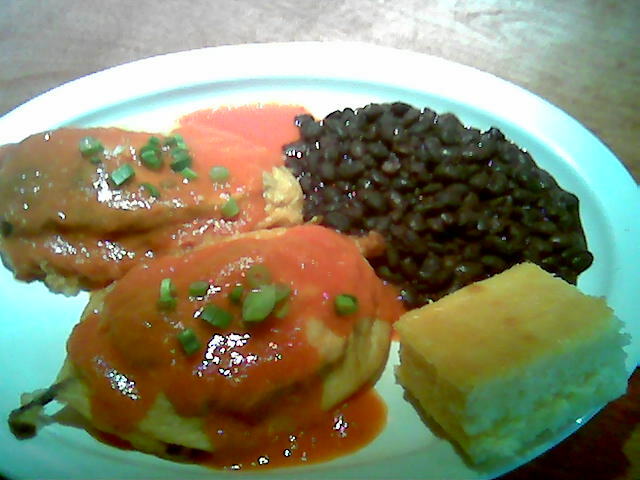 I was introduced to Chile Relleno at Penny Cluse Cafe, I’m using their version as a reference of what I like. I like the presentation of this plate, but taste-wise I think their could be some tweaks. First what is Chile Relleno? Chile Relleno consists of pan or deep deep fried pablano peppers, which are quite mild and have a nice flavor. Typically the peppers are stuffed with at least cheese, and finally covered with some sort of sauce / salsa. In Mexicali’s version, they stuff their pablanos with chicken and cheese. I love the fact that they went for something beyond cheese for the stuffing, however they used chicken cubed chicken breast. Chicken breast is healthy, but the texture and flavor is wrong for this dish. Shredded seasoned chicken would have been a much better choice. Additionally the sauce was a little bland (a suprise considering the yummy salsa bar options). Finally I didn’t like the eggy-breading, it concealed the sublte pablano flavor. The side of beans were good, but the cornbread missed, too sweet and moist. At $11, I would order something other than the Chile Relleno at Mexicali. Global Markets, Cafe, Grill and Grocery in the Old North End (ONE) in Burlington Vermont, as the name implies, serves up some diverse food and groceries. Global Markets is a cool place to go for lunch, for example you can get a Bosnian specialty for lunch, and then grab some Russian candy for desert off the shelf. Global Markets – Moving December 16th from its current location, down the street. Falafel – deep-fried chickpea or fava bean balls, served with house salad in pita. Falafel is a classic middle eastern snack, and what better place to get a falafel than at a place that specializes in middle-eastern and world food? I think that despite the deep-fried factor, this lunch is a fairly healthy vegertarian meal. 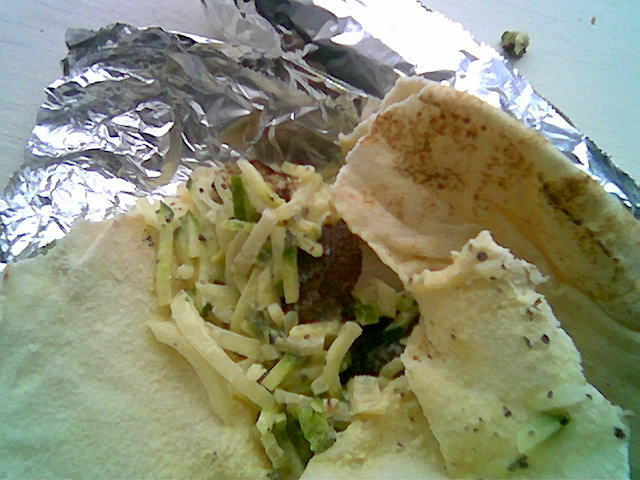 World Markets – Falafel, a little more detailed shot, showing the salad. I think it consists of cucumber, onion and tahini as the primary ingredients. The falafel and salad is made fresh before your eyes, and the owner / proprietor is very personable. The falafel is nice and crispy (fresh! ), and the salad has nice tanginess, acid and texture to contrast with the falafel. 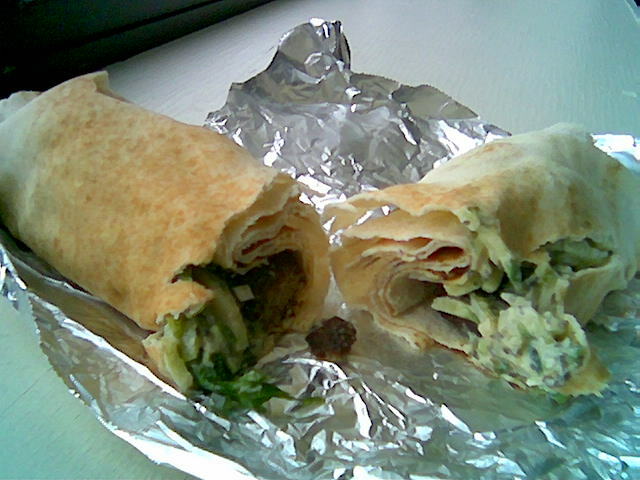 The falafel pita is not quite enough food for lunch, so I ordered two. But I found that two is little too much, I would recommend ordering one falafel pita, and one other small item off the menu, or maybe an interesting snack from the store shelves. The falafel is awful cheap at ~$3.60, bring cash as Global Markets is cash-only! I will be back to try some other world foods, and what is proclaimed as a great Philly cheesesteak in their new location.